Congratulations, San Antonio. 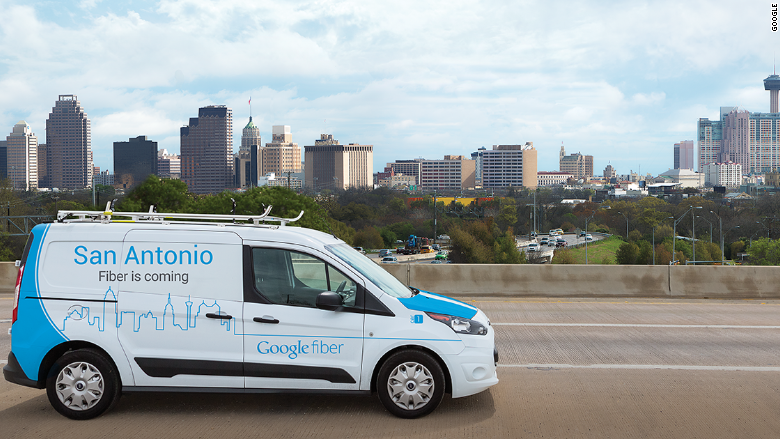 Google Fiber is coming to you next. With 1.4 million residents, the Texas city is the largest area to be covered by the company's ultra fast Internet network. The high-speed service promises customers speeds of 1 gigabit per second, which is a hundred times the speed of a typical broadband connection. 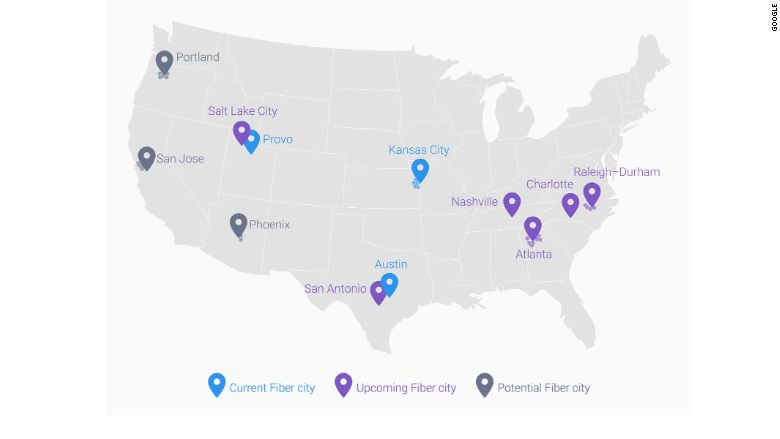 Google Fiber has been rolling out slowly, and is only available in the Kansas City area, Provo, Utah, and Austin, Texas, right now. Google (GOOGL) says it will begin the design phase for San Antonio soon. "We'll work closely with city leaders over the next several months to plan the layout of over 4,000 miles of fiber-optic cables -- enough to stretch to Canada and back -- across the metro area," Google's Mark Strama wrote in a blog post published on Wednesday. "This is no small task, and it will take some time, but we can't wait to get started." 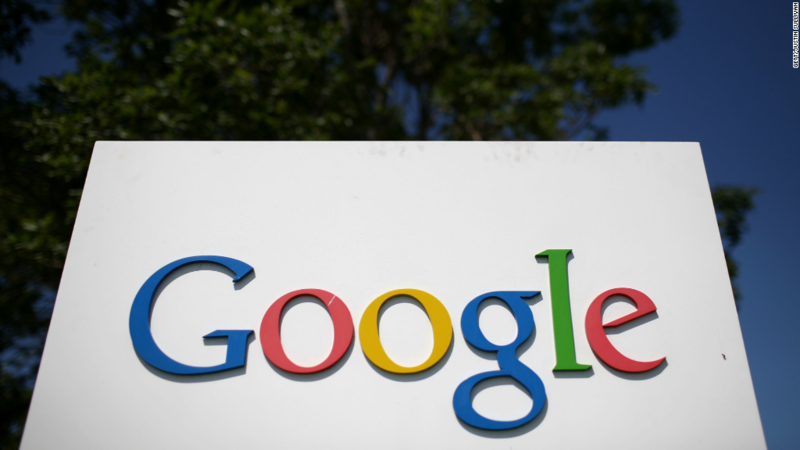 Customers of Google Fiber currently pay $70 a month, and $50 more for TV service. Google also offers slower, free Internet for a one-time installation fee, which costs about $300. Google Fiber connections are faster than many people need, even for those who stream Netflix (NFLX) or play XBox Live nonstop. But it's alluring to businesses and cities hoping to attract young talent with the presence of high speed Internet, and boost local economies. "Fast growing cities need Internet speeds that can keep up with their progress," Strama says. "From starting Bexar BiblioTech, the first all-digital public library in the U.S., to being named a leading city in cybersecurity, San Antonio has developed a thriving tech landscape." President Obama recently selected San Antonio for his Tech Hire and Connect Home initiative, which aims to help create a pipeline of tech jobs. Portland, another city he named, has also been targeted by Google as a future site for its Fiber network. As more gadgets gain the ability to access the Web, the desire for faster Internet is growing. Google is just one company working to satisfy the need for speed. Comcast (CCV), AT&T (T)and Time Warner Cable (TWC) are all looking to expand and grow their Internet service business. Google would benefit from people having faster Internet speeds, even if it's not the chosen provider.